Copyright 1986 by Praeger Publishers and reproduced with permission of Greenwood Publishing Group, Inc., Westport, CT. Read complete book here. And the Next Step After That . . . In late 1984 and 1985 we saw many events illustrating the vitality of the American space enterprise and the relatively high profile of space issues in public affairs. The Space Shuttle proved its versatility as a multipurpose vehicle, enabling its crew to retrieve and repair satellites while conducting scientific experiments and testing technologies for the expanded use of the space environment.2 Despite ciriticisms aimed at the cost of shuttle missions and at some technical problems, the Shuttle continued to be remarkably successful for a developmental vehicle until the Challenger tragedy of January 28, 1986. That searing disaster, which took the lives of five astronauts, a commercial payload specialist, and a schoolteacher, jolted Americans into a heightened awareness of human spaceflight. It brought with it a loss of innocence about the dangers of space travel and temporarily challenged the idea that ordinary citizens should go. It seemed certain to trigger a broader debate about the future of the American space program, including a revival of the manned vs. unmanned issue. As of this writing, that debate held some potential to be a new threat to the spaceflight dream. At a minimum, Shuttle operations seemed likely to be suspended for months. Yet the initial reaction to the loss of Challenger and the crew was remarkably positive. President Reagan certainly spoke for most Americans when he said that the manned space program must go forward. At the memorial service in Houston, he stated that both the Space Shuttle and the space station program would continue. There will be strong pressures to restore and perhaps expand America’s national launch capability, which may well be more impressive after the accident than before. The American space program may be stronger because of Challenger’s sacrifice. Sooner or later, the spaceflight participants program will be revived, once again giving ordinary Americans a more direct sense of participation. In the longer term, as we look back on the tragedy with some historical perspective, we may find that it had the effect of emotionally bonding many more Americans to the spaceflight dream. The aerospace community’s confidence in the future of America’s civil space program had seemed to be reinvigorated by the events of 1984, including the space station decision, the lively interest in space commercialization, and Ronald Reagan’s crushing victory in November. (“Four More Years: Aerospace Wins Big,” reported Aerospace America.) Funding for the Space Station survived challenges in Congress in 1984 and 1985, although at a lower level than NASA wanted. In the spring of 1985, the United States signed agreements with its European, Japanese, and Canadian partners for the design of the station. Meanwhile, space science also was showing new life, with the Galileo mission to Jupiter scheduled for launch in May 1986 and the Hubble Space Telescope for August 1986. Work was underway on a Venus Radar Mapper and a Mars Observer. Military activity in space continued to attract public attention. The first all-military Space Shuttle mission flew in January 1985, amid media controversy. Under Secretary of the Air Force Edward Aldridge was to fly on the first military Shuttle mission launched from Vandenberg Air Force Base in California in 1986. A unified Space Command went into operation at Colorado Springs in September 1985. The United States conducted a third test of its new anti-satellite (ASAT) system against a still-functioning Air Force satellite in September 1985. Meanwhile, the Strategic Defense Initiative (SDI) continued as a major research program, despite annual efforts by opponents to cut its funding. There was a recurrent public policy debate about whether the SDI was or was not a bargaining chip in arms control talks with the Soviet Union, which continued to criticize the SDI. In September 1985, Daniel Graham of High Frontier announced the formation of a Coalition for the Strategic Defense Initiative. Space arms control efforts achieved limited successes in restricting ASAT tests. 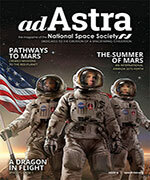 Space commercialization remained a hot topic despite setbacks. Tiny latex spheres, the first products made in space, went on sale in June 1985. By the spring of that year, the McDonnell Douglas/Ortho Pharmaceutical electrophoresis device was returning usable products to the Earth, although Ortho later pulled out of the project. Other successful experiments suggested that space industrialization may indeed have a future. Space Industries Incorported reached agreement with NASA in August 1985 on a human-tended “space factory” module. Efforts continued to identify and remove obstacles to space commercialization, including a report on the subject for the Aerospace Industries Association by space advocates David C. Webb and Courtney Stadd. But commercialization suffered a setback in the insurance field after satellite losses and the Challenger disaster, bringing the future availability of insurance and launches for commercial space ventures into some doubt. The future of the entrepreneurial launch vehicle companies also appeared to be in question by late 1985, although the loss of Challenger might open up some niches. After long and contentious debate, the U.S. government established a pricing policy for Space Shuttle launches that some argued would drive the small companies out of business. The pricing issue stimulated arguments about whether the government should or should not subsidize early commercial ventures into this new environment. Despite the decision, however, Space Services Incorporated pressed ahead with plans to launch cremated human remains into orbit. Meanwhile, the outlook for the privatization of space systems remained clouded. Agreement was finally reached on the transfer of the LANDSAT system to a company called EOSAT, but the expected government subsidy may not be provided. NASA appeared to have dropped the idea of private management of Space Shuttle operations. The idea of broader participation in spaceflight got a boost with the announcement that a schoolteacher would fly on the Space Shuttle in 1986. Over 10,000 teachers comepted for the honor. Sadly, winner Christa McAulliffe died in the Challenger explosion. Senator Jake Garn of Utah flew on the Shuttle in the spring of 1985, and Congressman Bill Nelson of Florida flew in January 1986. A journalist was to be the next citizen chosen for a ride on the Shuttle. However, there still were complaints that NASA’s astronauts were selected from too narrow a base. Meanwhile, former Office of Technology Assessment official Thomas Rogers proposed another approach to democratizing space: homesteading in orbit, using modified Space Shuttle external tanks. The U.S. space enterprise remained a continuing media event during late 1984 and 1985. A television adaptation of James Michener’s novel Space, an excellent four-part Public Broadcasting Service documentary on spaceflight, and a “Nova” program on “Space Women” were broadcast during the spring of 1985. Spectacular films shot from the Space Shuttle were shown at the National Air and Space Museum and at other locations. Advertisers continued to make heavy use of space themes, often using the Space Shuttle to symbolize achievement. There were other signs of strong public interest. The Space Camp at the Alabama Space and Rocket Center remained hugely popular and added a course for adults. Society Expeditions of Seattle distributed a prospectus for space tourism, with initial flights to cost $1 million on the Space Shuttle, or perhaps $50,000 on some future vehicle. The firm signed an agreement with launch vehicle entrepreneur Gary C. Hudson to develop a new launch vehicle by 1991. Meanwhile, entrepreneurs proposed a “space resort” in California. As for the new space advocacy, changes in the groups founded after 1972 suggested consolidation, professionalization, and a recognition of the central importance of manned spaceflight. Throughout much of 1984 and 1985, the L-5 Society and the National Space Institute discussed a merger of the two organizations, laying out a specific plan and polling their members on the subject. It seemed clear in both cases that an impor­tant motivation was declining membership. The L-5 Society’s H. Keith Henson warned of what happens when an activist organization merges with a stodgy one. Meanwhile, the two organizations cooperated in supporting the passage of space station funding, with the L-5 Society and Spacepac doing most of the grass-roots lobbying. An April 1985 Space Development Conference in Washington, D.C., was cosponsored by the L-5 Society, the National Space Institute, the American Astronautical Society, the American Space Foundation, Spacepac, and the Students for the Exploration and Development of Space. Of the new groups that appeared in late 1984 and 1985, the most significant may prove to be the Young Astronauts. In November 1983, columnist Jack Anderson had proposed to President Reagan that the space theme would be an effective means of stimulating interest in science and technology among young people and of improving the American educational effort in science and mathematics. In June 1984, the White House announced “Project Liftoff,” whose major component was the Young Astronaut Program. This was put together by the White House Office of Private Sector Initiatives, along with a number of corporations, professional societies, and nonprofit groups, including the National Space Institute. A Young Astronaut Council was inaugurated in Washington, D.C., on October 17, 1984. Its Director of Operations was Todd C. Hawley, leader of Students for the Exploration and Development of Space. The Council began sending materials to schools all over the country. Advertisements even appeared on supermarket shopping bags. By April 1985, Young Astronaut memberhship had grown to about 50,000, making it the second largest space interest organization in the United States. Even before then, Trudy E. Bell had speculated that the Young Astronaut organization would be a major success story for the space interest movement. Other new groups of interest included the American Interstellar Society, which proposed to spread participation in space activity by putting its members’ investments only into space enterprises, and Harrison Schmitt’s New Worlds organization. Both were reminiscent of themes enunciated by the Committee for the Future 15 years earlier. Diana Hoyt of the Congressional Space Caucus became president of a new Washington-based group called Women in Aerospace, and Save the Apollo Launch Tower became the Apollo Society. The American Society of Aerospace Pilots replaced its entrepreneurial founder, David Koch, and Marcia S. Smith became the first woman president of the American Astronautical Society. One of the most remarkable developments within the new space advocacy during 1984 was the endorsement of manned spaceflight by groups that had emphasized unmanned exploration. Impressed by an April 1984 USA Today poll that showed that 45 percent of Americans wanted to fly in the Space Shuttle, the World Space Foundation launched an “I Want to Go” campaign, featuring T-shirts and a proposed book on the subject. More significant was the “conversion” of the Planetary Society to the cause of manned spaceflight. The society commissioned Science Applications Incorporated to do studies of a lunar base and manned missions to Mars and the asteroids. The results, announced in November 1984, showed that such missions could be done more cheaply than critics had suggested. The Planetary Report devoted its March/April 1985 issue to human exploration of the solar system. Meanwhile, the society continued its support of the search for extraterrestrial intelligence with the help of a $100,000 donation from “Close Encounters of the Third Kind” director Stephen Spielberg. The society also supported a television special on Halley’s comet in November 1985. The United States was not the only place where space activity was on the upswing. The Soviet Union continued to operate and resupply its Salyut space stations. Its much-reported testing of its own spaceplane and space shuttle may lead to manned flights within the next decade. Eventually, the Soviet Union may move in the direction of its long-predicted Cosmograd, or “space city.” In March 1985, Soviet scientists dazzled an American audience in Houston by unveiling plans for future planetary exploration, including a 1988 mission to Mars and its moons. Soviet spacecraft have been launched to fly by Halley’s comet in early 1986, after looping around Venus. Meanwhile, the Soviets continue to conduct a very active military space program and are reported to be working on space weapons. Space capabilities have continued to spread beyond the two superpowers. European Space Agency members and Japan have ambitious plans for future projects, including manned space vehicles. They entered into cooperation with the United States on a space station largely to improve their own capabilities but may also have been encouraged by rising public interest in manned spaceflight, stimulated in part by the Space Shuttle. Both ESA and Japan launched probes toward Halley’s comet in 1985. The Peoples Republic of China has entered the commercial launch vehicle competition with its Long March 3. During the 1984-85 period, new national space centers were established in the United Kingdom and Italy. In these and other countries, space also is here to stay. As of 1985, it appeared that the U.S. space agenda for the next decade would be shaped largely by two major programs initiated by the Reagan administration: the space station and the SDI. Both seemed likely to require similar support technologies, such as new launch vehicles offering lower cost to orbit, whether those are heavy lift launch vehicles, shuttle-derived vehicles, or something else. Both programs also may need orbital maneuvering vehicles and orbital transfer vehicles. Along with expanded experience with working in space and assembling large structures there, these should improve the prospects for space industrialization and, in the long run, space settlement. The Space Shuttle will remain the workhorse of the American space program for the near future. However, initial planning for a second-generation manned vehicle seemed well underway by 1985, and a request for a new start seems likely within a decade. The debate around the SDI is likely to be far more acrimonious. This initiative is a huge research program; it could prove to be the single most important technology driver in the United States during the next decade, even if space-based anti-ballistic missile systems are never deployed. In that sense, it is the successor to the Manhattan Project and the Moon landing program. Unlike the space station, however, SDI also is a defense and arms control issue. Opponents may continue to attack its funding and seek to block specific tests of SDI-related systems. This could overlap into some systems useful for the expansion of the civil space enterprise, such as compact energy sources in space. As of 1985, many liberal opponents of the SDI were gathering around the idea of expanding U.S.-Soviet space cooperation, with several proposing a joint manned mission to Mars as an alternative to an arms competition in space. Among the prominent advocates were Senator Spark Matsunaga of Hawaii and the leaders of the Planetary Society. At a January 1985 symposium on space weapons at the National Academy of Sciences in Washington, D.C., Planetary Society President Carl Sagan called for a joint U.S.-Soviet landing on Mars by 2003. Another symposium in July 1985, marking the tenth anniversary of the Apollo­Soyuz Test Project, was entitled “Steps to Mars.” There Senator Matsunaga proposed an “International Space Year” beginning in 1992, the five hundredth anniversary of Columbus’ first voyage to America. However, any significant expansion of U.S.-Soviet space cooperation almost certainly would have to be preceded by an improvement in the political relationship between the two nations. This was recognized in the cautious assessment of U.S.-Soviet space cooperation issued by the Office of Technology Assessment in July 1985. In the near term, at least, NASA will remain the central pillar of the U.S. civil space enterprise. That agency can undertake missions that commercial firms would find unprofitable and that nonprofit organizations could not afford. The central course of U.S. civil space activity will continue to be determined by major program and budgetary decisions, regardless of what generalized policy statements or space policy acts may say. This will be true not only for “goal” projects such as a Moon base or a Mars landing, but also for major enabling technologies such as a human-rated orbital transfer vehicle. That means that the major decisions about space will be as much political as technical. There is risk in this. Arthur Kantrowitz and others have pointed out the example of the Ming navy in China, which was conducting great, politically motivated voyages of exploration until bureaucrats cut off funding for this “impractical” activity. Historian Walter A. McDougall has pointed out that massive state support of science and technology is a relatively new phenomenon, by implication raising the question of whether it is permanent. On the other hand, powerful sustaining forces for the space enterprise emerged more visibly during the first half of the 1980s: commerce and defense. Although still modest in scale as of 1985, space commercialization will in the longer run expand the economic constitutency for space activity and reduce its dependence on federal appropriations, making it less subject to politically motivated interruptions. A space commercialization consortium was under discussion in 1985. It would not be surprising to see the formation of a space industries association within the next ten years. Defense interests, always important in the space field, seem likely to grow. Whatever may be done in the space arms control field, the defense establishments of the major powers will remain active in space. The existence of a Space Command could enhance the prospects for the eventual creation of a separate U.S. space force, possibly with dedicated manned military spacecraft such as the proposed trans-atmospheric vehicle. Although a particular military system might not be available or suited for civil uses, history suggests that sooner or later many of its technologies would be transferred to the civil and commercial sectors. Older forces also will continue to affect the pace of government space programs. Competition from the Soviet Union — and increasingly from other nations and the European Space Agency — may spur greater U.S. efforts. Pride in the country and its achievements will remain an important factor. The use of space as an alternative to mlitary competition or even for some sort of international security system may have potential. However, the space agenda of the next decade will be dominated by defense and commercial interests if liberals do not come up with a persuasive, positive alternate agenda for space. There seem to be rough cycles in U.S. space history that may be repeated in the future. 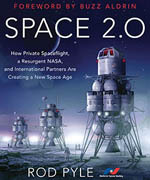 So far, each new administration since 1969 has had to be convinced that the broad space enterprise is worth not only expanding but continuing at the same level; each has been tempted to make the space program a target for budget-cutting because space spending (at least its civil side) is considered to be “discretionary.” This suggests that the civil space program could face another trauma in January 1989, when a new administration takes office. If that new administration is a Democratic one, will the Democrats by then have internalized a positive space agenda? There also seems to be a roughly once-a-decade cycle in the announcement of major civil space program decisions: Apollo in 1961, the Space Shuttle in 1972, the Space Station in 1984. This is both a political and a budgetary phenomenon; once the development costs of the current major project begin to turn down, it becomes possible to move toward the next one within an envelope of budgetary and political acceptability. This suggests that another major program decision will become politically feasible in the early or mid 1990s. If the classic agenda for manned spaceflight is followed, that decision will be for a Moon base. That also may be the time when a decision is made as to whether or not to deploy SDI systems in space, suggesting that the early and mid 1990s will be another time of intensified debate about the uses of space. There also may be further up and down cycles in cultural attitudes toward the space enterprise, probably connected with broader questions such as attitudes toward technology, the military, and the business world. However, growing public and political acceptance of the permanence and utility of space activity may mean that the ups and downs of U.S. civil space activity will be less sharp in the future; the cyclical changes may be less dramatic. The crest of the mid 1960s and the trough of the mid 1970s may never be repeated. Can we foresee provoking events that would disturb such a smooth continuity? International political and mlitary competition could produce such events, for example a sudden unilateral deployment of space-based weapons by the Soviet Union, although that seems both unlikely and qualitatively different from the broad challenge that Sputnik presented to the United States. There could be renewed concern about mineral and energy resources, with the space alternatives made more accessible through technological advance. Religious or social movements could have an impact. New ideas might appear on how to make other worlds more habitable. Astronomical discoveries, such as the detection of planets orbiting nearby stars, could spur interest. The detection of an extraterrestrial civilization could stimulate spaceflight activity. Or humans could reach some new consensus about the purposes of going into space. In the years 1984 and 1985 there was an intensified debate in the United States over future U.S. goals in space, spurred primarily by the space station decision and the SDI. At the heart of one school of thought is NASA’s own vision of what its goals should be, within political and funding constraints imposed by the White House and Congress. That vision comes close to being an updated version of the classic agenda for manned spaceflight and resembles the Space Task Group’s grand plan of 1969. Since the failure of that plan, NASA’s formal setting of goals has been limtied to relatively near-term projects. However, these have been accompanied by frequent suggestions of the agency’s longer-term aspirations. NASA’s 1985 Long-Range Program Plan, for example, is concerned primarily with the implementation of major program decisions already made. In the manned spaceflight field, the only specific major goals are to develop a fully operational Space Transportation System (of which the Space Shuttle is the heart), and to establish a permanent manned presence in space (the Space Station). However, there are strong hints of the directions in which NASA would like to go. Pioneering in space by building a permanent settlement on that vast frontier also has meaning with respect to the President’s third and fourth goals: “Strengthening our community of shared values,” and “a lasting and meaningful peace.” A community in space, with U.S. personnel working and functioning there, will reflect our shared values of a democracy in action for freedom and peace. NASA Administrator James Beggs has spoken often of NASA’s visions of the U.S. future in space. Speaking at the U.S. Naval Academy in March 1984, he said the agency’s future could include a manned space station in lunar orbit within about 20 years, a colony on the lunar surface by about 2010, initial construction of a manned station on Mars by about 2030, and a healthy and growing colony on Mars by 2040. Addressing the Aero Club in New York in October 1984, he reportedly pointed to the possibility of returning to the Moon and traveling to near-Earth asteroids to mine their resources and of the establishment of a manned base on Mars to explore and investigate the use of “this most habitable and resource-rich planet as a staging base for further exploration of space.” After interviewing NASA officials and space scientists, Washington Post science writer Thomas O’Toole predicted a space station in 1992, the Shuttle taking its first tourists around Earth soon thereafter, a Moon colony underway by 2010, and Martian colonists setting sail by 2035. Thomas 0. Paine, the principal advocate of the grand plan of 1969, said in late 1984 that the United States should take a bolder, broader, longer range look at a spaceport in low Earth orbit and the Moon and Mars as the focal points of twenty-first century space operations. Paine foresaw industrial processing using lunar and Martian resources. Low cost transport to low Earth orbit and an effective spaceport are the first milestones on the future “high road” to the Moon and Mars, he said. Paine thought that the economic, human, and technical resources required for the settlement of the Moon and Mars in the next century would be broadly available, and that the total investment to occupy and develop new worlds would represent about a tenth of a percent of the twenty-first century’s gross world product. Not everyone agrees with these expansive visions of the future in space. During 1984, the Office of Technology Assessment, some space scientists, and leading figures in the Planetary Society were particularly visible in criticizing the approach of NASA and the Reagan administration. In its November 1984 report Civilian Space Stations and the U.S. Future in Space, the OTA argued that “because the Nation does not have clearly formulated long-range goals and objectives for its civilian space activities, proceeding to realize the present NASA space station concept is not likely to result in the facility most appropriate for advancing U.S. interests in the second quarter-century of the Space Age.” In general, said the OTA report, the choices of space “infrastructure” should not be made without prior agreement on the future direction of the civilian space activities of the United States.” The most effective way to determine our direction in space, according to the report, “would be a national discussion of, and eventual agreement on, a set of long-range goals which the United States expects its civilian space activities to address.” NASA Administrator Beggs responded by saying that NASA’s major goals must be politically acceptable. The highly visible goals, he said, provide a focus around which NASA can develop its capabilities. To spread life, in a responsible fashion, throughout the solar system. The OTA report proposed objectives including a transportation service to the Moon and the establishment of a modest human presence there, and bringing at least hundreds of members of the general public per year into space for short visits. In its 1982 report on Civilian Space Policy and Applications, OTA had recommended reestablishing a mechanism similar to the old National Aeronautics and Space Council. In 1984, Congress authorized the creation of a National Commission on Space, and in 1985 the administration accepted the challenge. Addressing the National Space Club in March, President Reagan announced his appointees to the commission, which was to propose goals for the American civil space program by March 1986. The chairman was Thomas Paine, who had been NASA’s most visionary administrator. The new commission included representatives of both the older space advocacy and its newer successor: Paine, space colonization and industrialization advocate Gerard K. O’Neill, and David C. Webb, chairman of the National Coordinating Committee on Space. Other members were planetary scientists Laurel Wilkening, physicist Luis Alvarez, space scientist Paul J. Coleman, physicist and astronomer George Field, ITT Executive Charles M. Herzfeld, Massachusetts Institute of Technology professor Jack L. Kerrebrock, former astronaut Neil Armstrong, astronaut Kathryn Sullivan, former U.N. Ambassador Jeanne Kirkpatrick, and three retired military officers of general rank: Bernard Schriever and Charles (Chuck) Yeager of the Air Force and William H. Fitch of the Marine Corps. The three principal staff members of the commission were all representative of the post-Apollo space interest phenomenon: Library of Congress space expert Marcia S. Smith, IEEE Space Subcommittee chairman Theodore R. Simpson, and National Space Institute staffer Leonard W. David. The new space advocacy was drawn into the commission effort when David Webb arranged to have the L-5 Society, the National Space Institute, and the American Space Foundation conduct surveys of their members. Perhaps the most striking thing about the makeup of the Commisison is that one of its members was Gerard O’Neill. The visionary of the 1970s had been accepted by the establishment of the 1980s. It also is significant that the major antagonists in the new debate about U.S. goals in space agree on the need for goals broader than the space station, which most see as a stepping stone to other things. Many of those debating the issue have absorbed and used language introduced and spread by the new space advocacy. Most notably, many have accepted the idea of colonizing other worlds and possibly space itself, of sending humans into space to stay. Although some space advocates call for commitment to their entire vision as a package, coalitions form more realistically around one goal at a time. As soon as the U.S. government decides to take one major step, U.S. space advocates move on to the next, trying to build a constituency for it, to sell the idea over a period of years, and to make the eventual decision seem logical or even inevitable. Even before the space station decision, advocacies were becoming visible behind two further steps in the classic agenda for manned spaceflight: a Moon base and a manned mission to Mars. The first is openly led by mid-level NASA officials, with plenty of help from industry and other advocates. The second, emerging from a “Mars Underground,” is more in the tradition of the space dreamers of the 1920s and 1930s, an informal coalition of experts and enthusiasts with little institutional or economic interest in the outcome. The “Return to the Moon” lobby became visible during the debate over the space station decision, when some individuals found the project too limited and uninspiring and called for a “high option” of a lunar base. Presidential Science Adviser George Keyworth was a prominent member of this group. Former Apollo astronaut Edwin E. (Buzz) Aldrin and former NASA Associate Administrator George Mueller were lobbying openly for such a decision in late 1983 and early 1984. In fact, the agitation for a return to the Moon had been gaining momentum for at least two years before the space station decision, due in considerable measure to the efforts of Johnson Space Center officials Michael B. Duke and Wendell W. Mendell. In October 1983, Aviation Week reported that Johnson Space Center lunar and planetary scientists were proposing a small base on the Moon by the late 1990s, preceded by an unmanned lunar polar orbiter in the early 1990s. Duke and Mendell obtained a grant to conduct a workshop at Los Alamos National Laboratory in April 1984, with about 50 participants from within and outside the government. The resulting report, issued in September, provided the basis for a symposium held in Washington, D.C., in October 1984. The AIAA’s magazine Aerospace America, playing a familiar role, provided a forum for Duke and Mendell in its October 1984 issue. At the symposium, entitled “Lunar Bases and Space Activities of the 21st Century,” NASA Administrator James Beggs came close to endorsing the lunar base when he said, “I believe it is likely that before the first decade of the next century is out, we will, indeed, return to the Moon.” Keyworth told the same symposium that “a lunar base is only one of the more obvious next steps.” Duke pointed out at the symposium that most of the equipment needed for the project is already in existence or planned; the exception is that key piece of space technology, the orbital transfer vehicle. Science magazine, reporting on the symposium, described it as a trial balloon, an attempt by lunar base proponents to get the attention of the administration, the media, and NASA headquarters and judged that they were probably successful. “It remains to be seen,” concluded the Science report, “if they can build a compelling political case for the Moon.” By January 1985, Edward Teller reportedly was pushing for a lunar colony within ten years. A letter published in Aerospace America in February 1985 suggested selling the Moon by offering subscriptions to the common budget for its development, bringing back memories of the Committee for the Future’s Project Harvest Moon. The Moon base symposium helped bring together the advocates of the classic agenda and the space developers with a project both could support. NASA and the aerospace industry should be comfortable with the idea, having studied it in the 1960s. Once the Space Station is firmly on track, the Moon base could provide a new rallying point for the American space advocacy. Familiar arguments are likely to be heard pro and con, with manned spaceflight advocates and space developers strongly for the Moon base, while those favoring pure scientific research using unmanned vehicles may be against it. There also could be a debate as to whether a lunar base should be American or international. Turning points for the Moon base advocacy will be decisions to build a powerful, human-rated orbital transfer vehicle and to send a lunar polar orbiter to do a complete survey of the lunar surface. Judging by past experience, Moon base advocates will need several years to build a constituency for the project and to make the idea more familiar to the interested public through frequent exposure in the media. There the citizens’ pro-space groups could be helpful. NASA may repeat the space station pattern, forming a working group and doing intensive studies to prepare for its own formal advocacy of the project. The World Future Society has predicted a permanent U.S. base on the Moon by 2007. Another school of thought is focused by the old idea of a manned mission to Mars. First formulated in specific planning terms by Wernher von Braun in the 1950s, the Mars mission was part of the 1969 grand plan. However, NASA studies ceased after 1971. The Mars mission was given a subtle intellectual boost in the 1970s by Mariner 9 and the Viking missions, which revealed the Red Planet’s diverse and interesting surface in great detail, and which suggested that frozen water may be abundant on Mars. Although confirmation that the Martian atmosphere is very thin and cold was initially discouraging, would-be colonizers found hope in the science fiction idea of “terraforming,” altering a planet (particularly its atmosphere) to make it more Earth-like so that humans could live on it. Carl Sagan had suggested an approach to terraforming Venus in 1961 and to terraforming Mars in 1973. In 1976, NASA published a booklet entitled On the Habitability of Mars: An Approach to Planetary Ecosynthesis, prepared by NASA’s Ames Research Center in California and edited by M. M. Averner and R. D. McElroy. The study, which McElroy called the beginnings of planetary engineering, concluded that there was no fundamental insuperable limitation on the ability of Mars to support a terrestrial ecology. In 1978, Christopher P. McKay, a graduate student at the University of Colorado, led an informal seminar inspired by the NASA study (this was at about the time that a citizens pro-space movement was starting to diversify rapidly). The seminar developed into an ongoing effort that attracted other interested people. In March 1979, Penelope Boston and space writer James E. Oberg sponsored an informal session at the annual Lunar and Planetary Science Conference near Houston. In the spring of 1980, Leonard David of the National Space Institute suggested to McKay that the time was right for a conference to study the near-future possibilities of exploring and colonizing Mars. Stan Kent of the Viking Fund lent his support, and a decision was made to hold a conference entitled “The Case for Mars” at Boulder, Colorado. Hearing about the conference, mostly by word of mouth, speakers volunteered. A Mars underground began to form. The conference, sponsored by the University of Colorado Space Interest Group, the Viking Fund, and the Rocky Mountain sections of the American Astronautical Society and the AIAA, was held at the University of Colorado from April 29 to May 2, 1981 — just after the first Space Shuttle mission. Since no formal study of a manned Mars landing had been done since 1971, it was essentially a brainstorming session. However, it concluded that a manned Mars mission was a viable option for our space program. The conference brought the participants into direct contact; as Carol Stoker puts it, “We wanted to bring people out of the closet.” It also helped bring the Mars idea back into the view of the interested public. The second case for a Mars conference, cosponsored by the Boulder Center for Science and Policy and the University of Colorado Space Interest Group, was held July 10 through 14, 1984. By this time, the Planetary Society had established a Mars Institute, an informal network of experts headed by Chris McKay that is dedicated to studying the Red Planet. The Case for Mars II, whose purpose was to explore the potential for the colonization of Mars, drew many of the biggest names from the space advocacy and got a fair amount of media attention. A specific planning model for the Mars expedition, involving 15 people in three vehicles, was proposed. Planetary Society leaders and others, such as Senator Spark Matsunaga, have seen political potential in the idea of an international manned mission to Mars. In January 1985, Matsunaga introduced a resolution proposing cooperative efforts in space that could lead to a joint U.S.-Soviet mission. Carl Sagan appears to believe that a political motivation is the only convincing one for funding such a mission. Others have used the traditional tactic of pointing to alleged Soviet preparations for such a mission as a motivation for an U.S. response. By 1985, a new fissure seemed to have merged within the U.S. space interest movement, reopening the gap between the space developers and the space explorers and between different schools of thought about the political role of space activity. That split also may reflect a difference between the official, NASA view of the next step in space and a more visionary “High Option.” However, the American Space Foundation, which had appeared to support the classic NASA agenda, added a Mars Mission to its list of objectives in early 1985. There also is a small but persistent lobby for the ultimate trip: interstellar flight. Long a feature of science fiction, travel to other stars was taken up in a serious way by British space advocate Leslie Shepherd in an article published in 1950. Carl Sagan, in a 1966 book coauthored with Soviet astronomer Iosif Shklovskii, argued that flight to nearby stars is a feasible objective for humanity. In 1973, the British Interplanetary Society began a study of how an interstellar probe could be built with foreseeable technology. Published in 1978, Project Daedalus concluded that interstellar flight, although expensive and difficult, could be accomplished by a civilization only slightly in advance of our own. In the United States, the leading spokesman for the interstellar flight lobby has been Hughes Research Laboratory physicist and science fiction writer Robert L. Forward, who as long ago as 1975 presented a paper to the space subcommittee of the House of Representatives entitled “A National Space Program for Interstellar Exploration.” He and aerospace engineer Eugene Mallove also edited a bibliography on interstellar flight and communication. Forward, who finds U.S. aerospace technical societies too conservative, believes in selling the “pizzaz” of space exploration. Mallove also is a proponent of colonizing Mars. This small interstellar flight conspiracy, like the interplanetary lobby of the 1930s, is international. Its principal medium of communication is the quarterly “Interstellar Studies” issues of the Journal of the British Interplanetary Society. That journal has long been an outlet for ideas too visionary to be accepted by conservative U.S. technical journals. This apparently far-out idea was given a powerful boost during 1984 by space science discoveries that suggested that planets may be common attendants of other stars. The Infrared Astronomical Satellite revealed evidence that small objects were orbiting some nearby suns, and astronomers later succeeded in producing an image of a circumstellar disk. These discoveries provide new targets for exploration and possibly new alternate worlds to fire the imaginations of future generations. 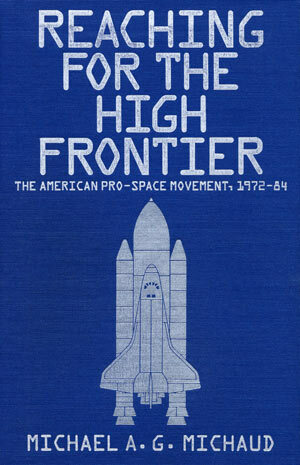 In 1976, Bainbridge wrote that “the next two decades will be a period of consolidation for the spaceflight movement.” This may have underestimated the reaction of the latent pro-space constituency to events such as the dramatic turndown in NASA’s fortunes. The organized part of that constituency grew rapidly after the publication of Bainbridge’s book. It now seems likely that the formal organized expression of the U.S. space advocacy will shrink with success. The surge of growth seen in the late 1970s and early 1980s has not continued at the same pace; the movement appears to be near the top of its sine curve for this generation. Formal memberships are likely to decline as the sense of emergency passes. The number of lasting groups will shrink before stabilizing. If the environmental movement is any example, the strongest space interest organizations will survive as semi-permanent features of the interest group landscape. The surviving larger organizations are likely to become more professional in their operations, and less strident than some have been in the past. Many of the smaller groups will disappear as their leaders move on to other things; others will merge with larger organizations. Space interest groups may find it easier to work together as they mature, as their entrepreneurial founders are replaced, and as proliferation ceases and consolidations occur. As the insecurity of new organizations fades, coalitions may become more feasible. However, it still will take sustained effort and good will to define an agreed agenda for the future in space beyond the Space Shuttle and the core program of the Solar System Exploration Committee. Old issues such as the manned vs. unmanned dispute may not go away. Newer ones, such as the question of weapons in space or the international legal regime for the uses of space, may become more divisive. The surveys reported in Chapter 7 suggest that there remains enormous potential for organizing the space interest constituency, as was not done for Apollo. That constituency is very diverse and overlaps with other interests. Ideally, different sections of the organized space advocacy could appeal to different sectors of that constituency, and all could take advantage of more sophisticated audience analysis and marketing techniques. Each organization might concentrate on its particular skills — educating the public, grass-roots lobbying, direct mail, fund raising, research and development — instead of trying to perform all roles. However, if the organized advocacy wants to be politically effective, it must do a better job of coalition-building, outside the space interest field as well as within it. Temporarily, at least, the new space movement may fall into the category of a post-success lobby. If the participation revolution fades, much of the organized space advocacy will fade with it. In the longer term, more members of younger generations may be able to turn space as an avocation into space as a vocation, turning them from citizens activism to conventional interest group activity. Space remains a symbol of the use of advanced technology to better the human prospect, while stimulating us with exploration, discovery, and achievement. This suggests that spaceflight will flourish in times of cultural confidence and optimism and that support for spaceflight will tend to decline during periods of cultural self-doubt and pessimism. In the case of the United States, we seem to have gone through one cycle already. However, there also is a reactive quality to the new organized space advocacy; it is in part a response to a downturn in the prospects for space activity. Says Benjamin Bova, “There is an inverse ratio between the vigor of space groups and the success of the civil space program.” If and when a major downturn in the U.S. civil space program occurs again, the space advocacy may resurge to keep the dream alive. Whatever organizational forms this advocacy may take, whatever its paid membership may be, the friendly conspiracy that underlies it will continue to exist, its members keeping alive what they believe is a revolution. The advocacy will continue to call for the next steps in the space dream, encouraging decision makers to be bold. This advocacy is different from others, in that it has in front of itself endless opportunities. Joseph P. Allen, Entering Space (New York: Stewart, Tabori, & Chang, 1984), p. 218. See “Roaming the High Frontier,” Time, November 26, 1984, pp. 16-20. For a more critical view, see William J. Broad, “In Harsh Light of Reality, the Shuttle is Being Reevaluated,” New York Times, May 14, 1985. “Four More Years: Aerospace Wins Big,” Aerospace America, January 1985, pp. 10-14. See also “Reagan Victory Margin Aids Defense, Space Objectives,” Aviation Week and Space Technology, November 12, 1984, pp. 16-17. Jeffrey M. Lenorovitz, “Joint Agreements Set Stage for Space Station Cooperation,” Aviation Week and Space Technology, April 1, 1985, pp. 16-17; “Canada Accepts Space Station Invitation,” Aviation Week and Space Technology, March 25, 1985, p. 23; “Japan Agrees to Participate in U.S. Space Station,” New York Times, May 10, 1985; and “ESA/NASA Space Station Agreement Signed at Paris Air Show,” Aviation Week and Space Technology, June 7, 1985. See note 15, Chapter 11. “Straphangers On,” Aviation Week and Space Technology, September 16, 1985, p. 15. Iver Peterson, “U.S. Activates Unit for Space Defense,” New York Times, September 24, 1985; “Pentagon Christens U.S. Space Command,” Washington Post, September 24, 1985. See note 122, Chapter 11 and Walter Pincus and Michael Weiskopf, “ASAT Weapon Destroys Satellite in Difficult Test,” Washington Post, September 14, 1985. “Coalition for SDI Formed,” High Frontier Newsletter, October 1985, p. 1. “Congress Approves 1986 Defense Budget, Bans ASAT Tests in Space,” Aviation Week and Space Technology, December 23, 1985, p. 19. “Space-Processed Latex Spheres Sold,” Aviation Week and Space Technology, July 22, 1985, p. 22. “Flight Produces Contamination-Free Hormone,” Aviation Week and Space Technology, April 22, 1985. See also “Commercial Space Prospects Brighten,” Aerospace America, April 1985, p. 1 and Thomas O’Toole, “Out-of-this-World Experiments,” Washington Post, April 9, 1985. Thomas O’Toole, “NASA Agrees to Launch Private Chemical Factory,” Washington Post, August 21, 1985; Craig Covault, “NASA Approves Fly-Now, Pay-Later Plan for Orbiting Industrial Facility,” Aviation Week and Space Technology, August 26, 1985, pp. 16-17; and William H. Gregory, “New Ideas in Space,” Aviation Week and Space Technology, August 26, 1985, p. 9. “New Study Finds Commercial Space Potential Uncertain, Expectations Too High,” Space Commerce Bulletin, May 24, 1985, p. 7. “New Pricing Policy,” Aviation Week and Space Technology, August 5, 1985, p. 13. For some critical views, see Chris Peterson, “Shuttle Pricing and Space Development,” L-5 News, January/February 1985, pp. 8-16. See “Former NASA Official Urges Space Commerce Subsidies,” Aviation Week and Space Technology, July 8, 1985, p. 86. “Conestoga Booster Will Launch Human Ashes for Space Burial,” Aviation Week and Space Technology, January 21, 1985, pp. 20-21; “Ashes to Ashes — to Orbit,” Science 227 (1985):615; “Ashes of the Stars,” Sky and Telescope, June 1985, p. 491. See, among others, “LANDSAT Threatened Again,” Science 228 (1985):308; “OMB Approves Funds to Shift LANDSAT to Private Sector,” Aviation Week and Space Technology, May 27, 1985, p. 19; “LANDSAT Logjam Finally Cleared,” Aerospace America, July 1985, p. 1. Craig Covault, “NASA, Defense Dept. Drop Idea of Private Shuttle Management,” Aviation Week and Space Technology, April 29, 1985, pp. 42-43. “Teacher Picked for Space Trip,” Washington Post, July 20, 1985; “Teacher Is Picked for Shuttle Trip,” New York Times, July 20, 1985; Richard A. Methia, “Riding the Blackboard Shuttle,” Newsweek, July 8, 1985, p. 8; Edwards Park, “Around the Mall and Beyond,” Smithsonian, August 1985, pp. 20, 22. “Garn, Head of Senate Space Panel, Is Chosen to Fly Aboard Shuttle,” New York Times, November 8, 1984; “NASA Invites Rep. Nelson to be Next Legislator Aboard Shuttle,” Washington Post, September 7, 1985. “Competition Set to Select Reporter for Shuttle Flight,” Aviation Week and Space Technology, October 25, 1985, p. 28; “Journalist to Fly on 1986 Shuttle Mission,” Aerospace Daily, October 25, 1985, p. 300; “Journalists Race for Space,” Space Business News, November 4, 1985, p. 4. Letter from Al Stewart, Aviation Week and Space Technology, September 9, 1985, p. 120. Thomas F. Rogers, “Homesteading the New Frontier,” Space World, June 1985, pp. 4-6. He had presented a paper on this subject in May 1985 at the AIAA Annual Meeting in Washington, D.C. See “Station Role Proposed for Shuttle Tanks,” Aviation Week and Space Technology, April 29, 1985, p. 145. William E. Schmidt, “Young Space Enthusiasts Crowd Alabama Camp,” New York Times, September 8, 1985; Lance Morrow, “In Alabama: The Right Stuff,” Time, October 14, 1985, pp. 14, 20. A Society Expeditions advertisement for “Project Space Voyage” appeared in the New York Times on May 12, 1985. See also Leonard W. David, “Commuting into the Cosmos,” Space World, August 1985, p. 9; “Project Space Voyage,” brochure from Society Expeditions, June 1985; and “Launcher Company, Travel Agency Reach Space Tour Pact,” Aviation Week and Space Technology, September 30, 1985, p. 24. David White, “Space Resort Site Being Sought in Ventura County,” Los Angeles Times, March 25, 1985. L-5 Society letter from Gordon R. Woodcock, June 17, 1985 (with enclosed survey); Ben Bova, “President’s Message August 1985,” Insight (National Space Institute), August 1985, pp. la, 3a; “L-5/NSI Merger Plan Summary,” undated L-5 Society circular, 1985. Letter from H. Keith Henson, L-5 News, September 1985, p. 15. Undated Spacepac letter from Ken Swezey, early 1985; undated National Space Institute Letter from Hugh Downs, January 1985; “The Space Station War: The Battle of Senate Authorizations,” undated L-5 Society circular, August 1985. Jack Anderson, “President Hopes to Spur Youths into Space Age,” Washington Post, July 6, 1984. National Space Institute Press Release, June 20, 1984. See Ellen I. Kelley, “The Young Astronauts,” Aerospace, Summer 1985, pp. 14-16 and T. Wendell Butler, “The American Young Astronaut Program: A First Year Status Report,” paper presented to the Congress of the International Astronautical Federation, Stockholm, Sweden, October 1985. Trudy E. Bell, Upward: Status Report and Directory of the American Space Interest Movement, 1984-1985, pp. 69-72, available from author. See, for example, the World Space Foundation advertisement in Discover, August 1985, p. 82. See Louis D. Friedman, “Visions of 2010: Human Missions to Mars, the Moon, and the Asteroids,” The Planetary Report, March/April 1985, pp. 4-5. Undated Planetary Society letter from Louis D. Friedman, 1985. Spielberg flipped the switch to begin the operation of the Megachannel Extraterrestrial Assay on September 29, 1985. Undated circular letter from the United States Space Foundation, ca. 1984; undated leaflet “The United States Space Foundation: Overview,” ca. 1984; T. R. Reid, “Life Looks Up for City After a Cosmic Coup,” Washington Post, December 3, 1984. Craig Covault, “Soviets in Houston Reveal New Lunar, Mars, Asteroid Flights,” Aviation Week and Space Technology, April 1, 1985, pp. 18-20; M. Mitchell Waldrop, “A Soviet Plan for Exploring the Planets,” Science 228 (1985):698, 703; James E. Oberg, “Soviets Unveil Upcoming Deep-Space Probes,” Aerospace America, June 1985, pp. 92-94; and “Soviets Planning 1988 Mission to Study Martian Moon Photos,” Aviation Week and Space Technology, October 28, 1985, pp. 66-67. “Soviet Strategic Defense Programs,” a booklet released by the U.S. Department of Defense and the U.S. Department of State, October 1985. Jeffrey M. Lenorovitz, “Europeans Developing Space Plans for the 1990s,” Aviation Week and Space Technology, December 21, 1981, pp. 52-53; “ESA Defining Future in Space,” Aviation Week and Space Technology, October 4, 1982, p. 22; Jeffrey M. Lenorovitz, “Germany, Italy Propose Space Station,” Aviation Week and Space Technology, February 20, 1984, pp. 55-56; David Dickson, “French Take Steps for European Space Station,” Science 224 (1984):1413; Jeffrey M. Lenorovitz, “ESA Approves New Ariane Launcher, U.S. Station Role,” Aviation Week and Space Technology, February 4, 1985; Kenneth Owen, “Ariane 5 and Columbus Spearhead New ESA Program,” Aerospace America, April 1985, p. 24; Pierre Langereux, “Hermes. France’s Winged Space Messenger to Fly in 1995,” Aerospace America, August 1985, pp. 13-18; “Japan Studies Small Shuttle Development,” Aviation Week and Space Technology, October 4, 1982, p. 22; and “Japan Prepares for Next Space Phase,” Aviation Week and Space Technology, March 12, 1984, pp. 129-30. See John Noble Wilford, “European Probe is Aimed at Halley’s Veiled Heart,” New York Times, July 2, 1985. James J. Harford, “Chinese Launch Vehicles for Sale,” Aerospace America, July 1985, pp. 20, 90, 92. “British Institutionalize Space,” Aerospace America, May 1985, p. 1; “Italy Plans Cabinet-Level Space Agency,” Aviation Week and Space Technology, September 24, 1984, p. 19. See Johan Benson, “SDI Presages New Space Transportation,” Aerospace America, May 1985, pp. 28-30. James Beggs, “Space Station: The Next Logical Step,” Aerospace America, September 1984, pp. 47-52, 48. Walter Froelich, Space Station: The Next Logical Step (Washington, D.C.: National Aeronautics and Space Administration, 1985), p. 47. See, for example, “Industry, Scientists Seek Approaches to Tap SDI’s Commercial Potential,” Aviation Week and Space Technology, November 25, 1985, p. 75. John Noble Wilford, “Seminar Envisions US-Soviet Mars Venture,” New York Times, July 17, 1985; Thomas O’Toole, “U.S.-Soviet Mars Mission Urged,” Washington Post, July 17, 1985; “Humans on Mars? Why Not?” Time, July 29, 1985, p. 67. See Jerry Grey, “Mars or Bust,” Aerospace America, September 1981, pp. 24, 26, 102. U.S.-Soviet Cooperation in Space: A Technical Memorandum (Washington, D.C.: Office of Technology Assessment, 1985). See also John Noble Wilford, “Study Sees Gains from US-Soviet Space Efforts,” New York Times, July 18, 1985. Arthur Kantrowitz, “The Ming Navy and the U.S. Space Program,” Astronautics and Aeronautics, September 1981, pp. 44-46. Walter A. McDougall, “Technocracy and Statecraft in the Space Age,” American Historical Review 87 (1982):1010-40. “Space Commercialization Group Includes Non-Aerospace Firms,” Aviation Week and Space Technology, March 4, 1985, p. 20. William S. Bainbridge, The Spaceflight Revolution (New York: John Wiley & Sons, 1976), pp. 247-52. 1985 Long-Range Program Plan (Washington, D.C.: National Aeronautics and Space Administration, 1984), p. 11-2. “Beggs Discusses Long-Term Space Plans,” Aerospace Daily, March 27, 1984, p. 149 and “Space Colonies,” Aviation Week and Space Technology, March 26, 1985, p. 15. “Space Station Symbolizes Evolution of U.S. Space Activities: Beggs,” Aerospace Daily, October 25, 1984, pp. 295-96, 196. Thomas O’Toole, “NASA’s Master Plan,” Omni, December 1984, pp. 70-72, 148, 150. “Space Station Is Only the Beginning, Keyworth Says,” Aerospace Daily, July 3, 1984, p. 13. “Paine Defines Space Goals for Next Century,” Aerospace Daily, October 31, 1984, p. 323. Michaud had suggested the .1 percent goal in “Spaceflight, Colonization, and Independence,” Journal of the British Interplanetary Society 30 (1977). Civilian Space Stations and the U.S. Future in Space (Washington, D.C.: Office of Technology Assessment, 1984), p. 4. As quoted in “Science and the Citizen,” Scientific American, January 1985, p. 54. Civilian Space Stations and the U.S. Future in Space, p. 113. Civilian Space Policy and Applications (Washington, D.C.: Office of Technology Assessment, 1982), pp. 18, 276-77. “Reagan Appoints Commission to Guide Civil Space Effort,” Aviation Week and Space Technology, April 8, 1985, pp. 19-20. See also Philip J. Klass, “Commission Considers Joint Mars Exploration, Lunar Base Options,” Aviation Week and Space Technology, July 29, 1985, pp. 47-48 and “Panel Will Report on Long-Term Space Plans,” Aviation Week and Space Technology, July 29, 1985. See David C. Webb’s letter in Aviation Week and Space Technology, September 23, 1985, p. 168. “Lunar Base,” Aviation Week and Space Technology, December 19, 1983, p. 17 and Buzz Aldrin, “Let’s Return to the Moon for Good,” Los Angeles Times, July 22, 1984. See Michael A. G. Michaud and Leonard W. David, “Return to the Moon,” Astronomy, April 1980, pp. 6-22; Julian Loewe, “Lunar Habitats,” Omni, December 1982, pp. 172-81; Andrew Chaikin, “Return to the Moon,” Sky and Telescope, June 1983, p. 493; Wendell W. Mendell, “Return to the Moon,” Aviation/Space, Fall 1983, pp. 28-29. Craig Covault, “NASA Answers Planning Challenge,” Aviation Week and Space Technology, October 31, 1983, pp. 21-23. Michael B. Duke, Wendell W. Mendell, and Barney B. Roberts, “Toward a Lunar Base,” Aerospace America, October 1984, pp. 70-73. See M. Mitchell Waldrop, “Asking for the Moon,” Science 226 (1984):948-49; Walter Sullivan, “Scientists Chart a Return to the Moon for New Exploits,” New York Times, December 4, 1984; Mark Washburn, “The Moon — A Second Time Around?” Sky and Telescope, March 1985, pp. 209-11; “Beggs Sees Return to Moon Early in Next Century,” Aerospace Daily, October 30, 1984, pp. 314-15; “Aerospace Perspectives,” Aerospace, Winter 1984, inside front cover. “Lunar Colony,” Aviation Week and Space Technology, January 7, 1985, p. 15. Letter from Milan Posposil, Aerospace America, February 1985, p. 9. “Futurists See Growth in Robot Population,” New York Times, December 27, 1984. Wernher von Braun, Mars Project (Urbana: University of Illinois Press, 1953) and Wernher von Braun and Willy Ley, The Exploration of Mars (New York: Viking Press, 1956). See William K. Hartmann and Odell Raper, The New Mars: The Discoveries of Mariner 9 (Washington, D.C.: National Aeronautics and Space Administration, 1974). Carl Sagan, “The Planet Venus,” Science 133 (1961):849-58 and Carl Sagan, “Planetary Engineering on Mars,” Icarus 20 (1973):513-14. For a general discussion of terraforming, see James E. Oberg, New Earths (Harrisburg, Pa.: Stackpole Books, 1981). M. M. Averner and R. D. McElroy, eds., On the Habitability of Mars: An Approach to Planetary Ecosynthesis, prepared by the Ames Research Center (Washington, D.C.: National Aeronautics and Space Administration, 1976). See also Arthur L. Robinson, “Colonizing Mars: The Age of Planetary Engineering Begins,” Science 195 (1977):668 and Carl Sagan’s review of James Lovelock and Michael Allaby’s The Greening of Mars, New York Times Book Review, January 6, 1985, p. 6. See Penelope J. Boston, ed., The Case for Mars, volume 57, Science and Technology Series (San Diego: American Astronautical Society [Univelt], 1984). See also Christopher P. McKay, “A Focus on Mars,” in Paul Anaejionu, Nathan C. Goldman, and Philip J. Meeks, Space and Society: Challenges and Choices (San Diego, Calif.: American Astronautical Society [Univelt], 1984), pp. 411-16. See Andrew Chaikin, “Mars or Bust,” Discover, September 1984, pp. 12-17, 12. See Chaikin, “Mars or Bust”; Michael W. Carroll, “The First Colony on Mars,” Astronomy, June 1985, pp. 6-21; Christopher P. McKay, ed., The Case for Mars II (San Diego: American Astronautical Society [Univelt], 1985). Carroll later wrote that the Planetary Society had made both Case for Mars conferences possible. Letter in Astronomy, September 1985, p. 39. Senate resolution 18, introduced by Senators Spark Matsunaga, William Proxmire, and Paul Simon, January 21, 1985. James E. Oberg, “Racing the Soviets to Mars,” Omni, March 1985, pp. 45-46, 112, 115 and James E. Oberg, “Russians to Mars?” Analog, September 1985, pp. 52-61. K. Eric Drexler, “Space Development: The Case Against Mars,” L-5 News, October 1984, pp. 1-3. “Goals of the American Space Foundation,” paper dated February 25, 1985, copy kindly provided by William G. Norton. Leslie R. Shepherd, “Interstellar Flight,” Journal of the British Interplanetary Society 11 (1952):149-55. Losif Shklovskii and Carl Sagan, Intelligent Life in the Universe (New York: Delta, 1966), p. 449. Project Daedalus: The Final Report on the BIS Starship Study, supplement to the Journal of the British Interplanetary Society, 1978. Robert L. Forward, “A National Space Program for Interstellar Exploration,” in Future Space Programs 1975, a compilation of papers prepared for the Subcommittee on Space Science and Applications of the Committee on Science and Technology, U.S. House of Representatives, Volume II (Washington, D.C.: U.S. Government Printing Office, 1975), pp. 279-326. Eugene F. Mallove, Robert L. Forward, Zbigniew Paprotny, and Jurgen Lehmann, “Interstellar Travel and Communication: A Bibliography,” Journal of the British Interplanetary Society 33 (1980):entire issue. Interview with Robert L. Forward. Eugene F. Mallove, “Mars: A Great Planet, But It Needs a Little Work,” Washington Post, December 16, 1984. “IRAS News: Tempel 2 and Vega,” Astronomy, November 1983, pp. 62-63; Paul R. Weissman, “The Vega Particulate Shell: Comets or Asteroids?” Science 224 (1984):987-88; Thomas O’Toole, “Telescope Finds Third Solar System,” Washington Post, December 17, 1983; Thomas O’Toole, “Mystery Heavenly Body Discovered,” Washington Post, December 30, 1983; “NASA Scientist Finds Nascent-Planet Sites,” Washington Post, June 13, 1984; and “Astronomers Locate Possible Solar System Around Star,” Aviation Week and Space Technology, November 19, 1984, p. 99. Bainbridge, Spaceflight Revolution, p. 235. Robert H. Goddard, in a letter to H. G. Wells, 1932. Bainbridge noted Durkheim’s observation that anomie can result from the loss of a ceiling to our aspirations. “The conquest of the universe,” Bainbridge wrote, “is itself an anomic goal.” Spaceflight Revolution, p. 193.